What to look for when buying a stunt scooter. Firstly, don't buy a scooter with a folding mechanism. In order to do tricks the scooter needs to be able to withstand the impact of jumps and landings. A folding mechanism will weaken the scooter so it will be unable to withstand these kinds of impacts on a regular basis. What you need to look for is a scooter with a one piece bar and deck. Decks are generally around 50cm in length and 10cm in width and most stunt scooters are aimed at kids from aged 8 plus. Younger children may benefit from a slightly smaller deck as it is easier to control with a smaller height and feet. When choosing a scooter and looking at the decks it will be worth considering the child in question. One scooter that has a smaller deck is the mgp vx mini pro. There are many cases of younger children using the stunt scooters for over 8. How tall is the child? How big are there feet. My 8 year old has size 3 ½ feet so a standard size deck is fine for him which we bought at age 7. How long do you want the scooter to last for as obviously shorter decks will decrease the lifespan of the scooter for your child. What are decks made of? The deck tends to be made of aluminium which is strong but lightweight. Some aluminum decks have been heat treated to add extra strength and durability. In general, the more the scooter costs the better the quality of the deck. A more expensive scooter should generally have a strong deck with a lightweight design. What size handlebars should I get on a stunt scooter? 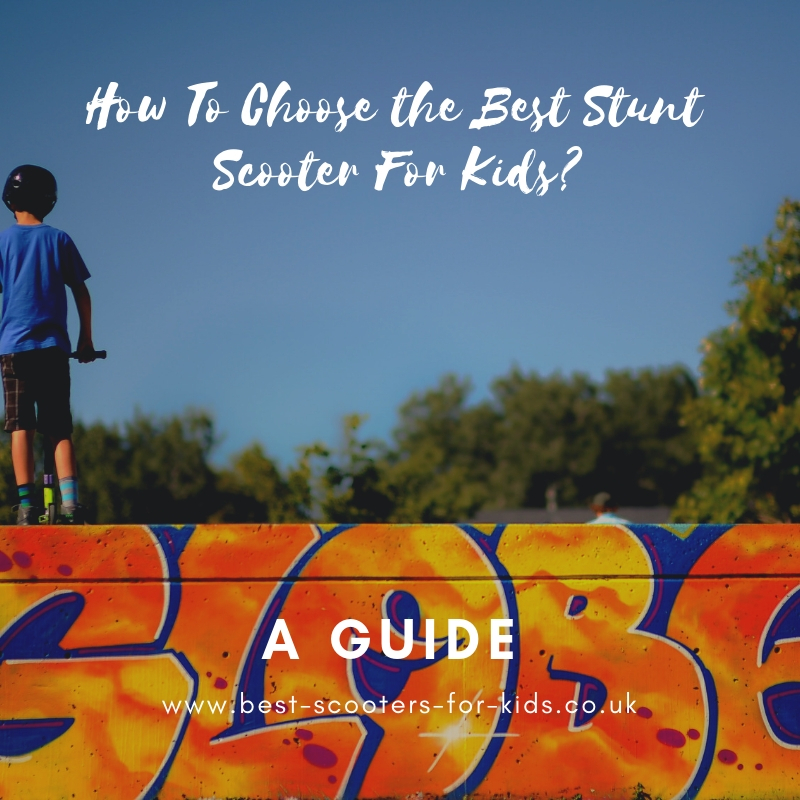 Sometimes it's difficult to answer this question as people tend to have different preferences as to how high and wide they like the bars on their scooters,, but find some general guidance below. Some scooters will specify the ride height. This is the measurement between the deck and the handlebars. Other scooters will specify the full height of the scooter. This is the measurement from the floor to the top of the handlebars. Smaller children will want a handlebar which is narrower. Bar width tends to run between 46cm to 56cm (18" - 22"). So younger smaller children will be better with bars on the narrower side of this range. As kids/teens get older a good suggestion is to go by the shoulder width. So if they have 21" shoulder width, a bar of about 20"-21" shoulders will be a good size. The size of the person riding the scooter will have a huge bearing on the size of the bars to get. Smaller kids will want smaller bars than teenagers and adults. From aged 8 - Age 8 plus is the recommended age for many first full sized pro stunt scooter. The bars on these scooters range from around 20" to 23". Smaller kids will want smaller height bars at around 20". As kids get older towards the teen years, they may pick bars anywhere between 20 to 24 inches. It will depend on how high they want the bars (if they prefer hip or waist height). Check out some first stunt scooters for kids. Adult - A full grown adult will again be looking at 2o to 24 inch bars. The taller you are the bigger you want the bars. Adults over 6 foot will want 23 or 24" bars. Most stunt scooters will have metal cores in their wheels and not plastic ones that you may find on a normal kick scooter. Again, this is because metal cores are stronger to withstand the extra punishment riders give their scooter at the skate park. You may also see metalized cores on stunt scooter wheels which are stronger than the plastic core wheels but not as good as alloy cores. You will need a scooter with harder wheels (around ) again to withstand the impact of the tricks. You will see the hardness of wheels given as a durometer (followed by an A). With scooter wheels you tend to get durometers ranging from 74A to 88A. Stunt scooters tend to have wheels around the 84A to 88A mark. They are a little bit more hardwearing than wheels of other scooters. Wheels will also tend to be on the standard side (around 98-100mm to 110mm). On higher end stunt scooters you will often see 120mm wheels. The bigger the wheel the smoother the ride as they absorb the impact from uneven bumps better. Grip tape is tape used on the deck of the scooter to ensure the rider doesn't slip. The clamp is needs to be strong as this is what connects the deck, the forks and the handlebars together and it needs to be strong to withstand the impact of jumps and tricks. Most stunt scooters have a double, triple or quad clamp. As the construction of a stunt scooter has to be stronger, it will be heavier too. This means they are not great for carrying around if your child has had enough scooting. Most stunt scooters tend to weight between 3.4 and 4.5kg. Obviously lighter stunt scooters will be easier for younger kids to control and use. However, lighter but strong stunt scooters tend to be more expensive. As scooters get better specs (bigger wheels, stronger decks and bars), scooters can get heavier. A lot of what goes into designing higher end scooters is to provide stronger scooters but also keeping them lightweight to get the best performance when doing tricks. This is often what you are paying the higher prices for on the pro scooters. Very strong, bigger wheels but lightweight. You will see two different types of brakes when buying a stunt scooter. A spring brake and a flex brake. A flex brake is superior as spring brakes may get rattly with lots of use (due to springs loosing their tension over time). Having said this, a spring brake may be find for a younger chlid who going to put let pressure on it when they use it. Forks connect the wheels to the frame of the scooter. You will often see forks described as threaded forks or threadless forks. A threaded fork uses a thread cut into the top of the scooter fork to add compression to the headset and keep it all in place, which means they have a weaker point which can snap under lots of pressure. ​A threadless fork is stronger and tends to be found on more expensive scooters. Threadless forks are better and are what the professionals will use as they will last for longer but what you get will depend on the budget you have and how much you want to use the scooter. The headset is the part that enables the fork tube to rotate within the head tube is the headset. The top pro scooters often come with a sealed headset which needs a threadless fork and a compression system. This helps the scooter run smoothly. If the scooter has a threadless fork it will also have a compression system to hold the fork in place. There are three types of compression systems HIC (hidden compression system), SCS (standard compression system) and ICS (internal compression system). They all have their advantages and disadvantages but if you are buying a scooter with a threadless headset you will need an compression system. As stunt scooters tend to be built out of stronger material they tend to cost more too. However they also tend to last longer, so over time they may actually work out as a better investment. You should also be able to replace parts on many stunt scooters so that even when wheels and other parts have worn out you can still use the scooter for years to come if you replace just certain part.